Fitted wedding rings from Serendipity Diamonds. Discover a collection of fitted wedding rings in plain and diamond set designs. We design, create and produce some of the finest shaped wedding bands made in our UK workshop—made available with worldwide shipping. Decoratively styled shaped wedding ring featuring sparkling round brilliant cut diamonds with scalloped edge detail and a gently curving design. The scallop-shaped wedding ring features 0.14 carats of round brilliant cut diamonds, graded G colour and SI1 clarity. Each diamond is precision set into a gently shaped band with a curved inner edge to fit alongside a diamond engagement ring setting. This floral styled diamond set wedding ring radiates with brilliance. Sparkling with brilliant cut diamonds, the attractive flower design enhances the beauty of a solitaire engagement ring. 0.08 carats of diamonds. 10 x 1.1mm fully brilliant cut diamonds. G colour SI1 clarity. Available in a choice of precious metals including 18ct White Gold, Yellow Gold and Platinum. Please allow approximately 4 weeks for this design to be crafted. Beautifully crafted shaped diamond set wedding ring. Created as a bespoke wedding ring this exquisite design sparkles with grain set diamonds in a gently curved shaped wedding ring design. Set with 0.25cts of diamonds, this elegant shaped wedding ring is created to fit with the curvature of your engagement ring. We hand sort 25 x 1.3mm round brilliant cut diamonds, graded G colour and VS clarity held within a court shaped 2.5mm wide band. The Pink sapphire and diamond shaped wedding ring bursts with natural vibrant pinks sapphires alternating with dazzling white diamonds. Approximately 0.25cts of gemstones shine within grain settings across a gently shaped wedding band crafted to fit alongside your engagement ring. 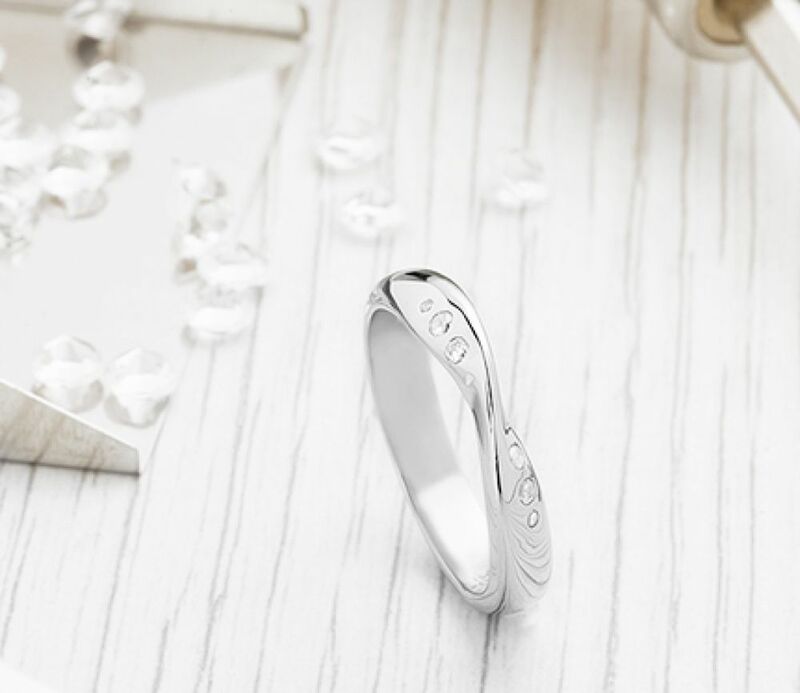 Each ring is made as a bespoke commission allowing for additional personalisation and individual customisation. Measuring approximately 2mm wide, the pink sapphire and diamond shaped wedding ring curves gently with 6 x 1.5mm round brilliant cut diamonds alternating with 5 x natural pink sapphires achieving a carat weight of 0.13cts. Vintage styled shaped diamond wedding ring, with Horseshoe shaped design. This elegant design features a milgrain textured edge and is created to fit to an existing engagement ring setting. Set with approximately 0.25cts of brilliant cut diamonds, the Horseshoe shaped wedding ring elegantly re-creates vintage charm with delicately milgrain textured edges, surrounding grain set diamonds dazzling across the upper section of the wedding ring. This distinctive contoured, V-shaped wedding ring, features a subtle V shaped recess shaped into one side of the wedding ring. A raised edge provides elegant detailing, accommodating an engagement ring setting while the flat opposite edge lends traditional styling. Both elements of this shaped wedding ring flow together to create a truly unique shaped wedding ring design. Overall ring width 3.5mm wide, with a subtle recess for an engagement ring setting. Styled with a court shaped profile and raised edge detail, available in a choice of precious metal options. Please allow 3-4 weeks for this design to be crafted to order. Shaped and contoured wedding ring, mirror polished to perfection, styled to fit an existing part bezel set diamond engagement ring. This pre-designed wedding ring perfectly fits the Zoe engagement ring design and is crafted to order over 4 weeks. Alternative shaped wedding rings can be commissioned through our dedicated shaped wedding rings service. Created to fit around R1D010, our bezel set diamond ring with crossover shoulders. 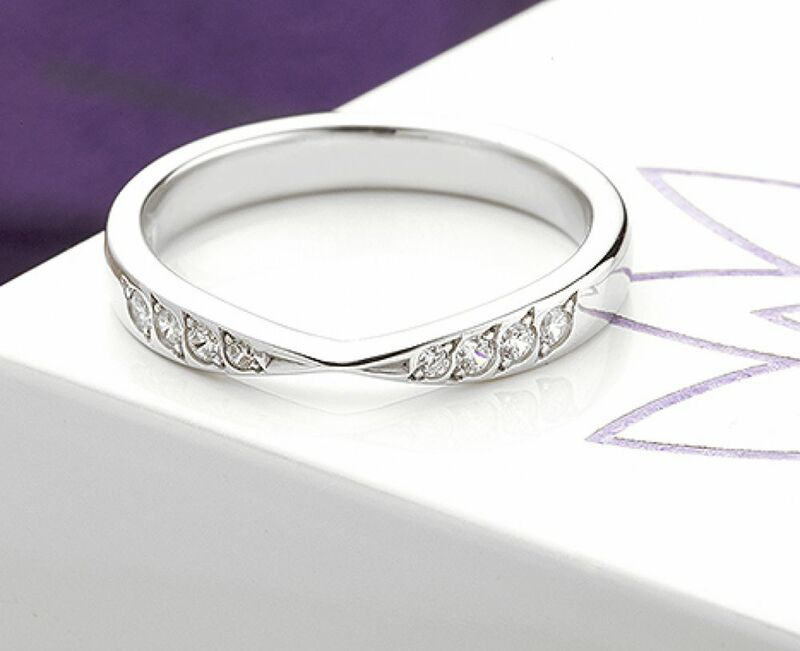 This contoured shaped wedding ring provides a perfect flush fit. If you have any doubt about the suitability of this design with your own engagement ring, we can create a bespoke design to fit to your existing ring. Talk to us about this service. Typically the above ring will take around 3 weeks to produce. Ribbon twist wedding ring. This simply elegant shaped wedding ring combines the simplicity of a plain wedding band with a feature twist. Twirled ribbon styling adds a beautifully fluid effect to a distinctive wedding ring design, narrowing in the middle, available in three different width options in alternative precious metal choices. Medium weight ribbon twist shaped wedding ring available in a choice of 3 x widths. Choose from 2.3mm wide, 2.8mm wide and 3.3mm wide in range of metal choices. This style can also be custom made to fit appropriate engagement ring settings. This elegant plain wedding ring has a folded twist ribbon effect and makes a refreshing change from other shaped wedding ring alternatives. Elegantly styled, bespoke shaped diamond set wedding ring designed for and Emerald cut diamond engagement ring setting. The angular styling of this beautifully crafted wedding ring ensures a perfect fit around your Emerald cut engagement ring, crafted alongside your ring to ensure a perfect fit. Set with approximately 0.25cts of brilliant cut diamonds, we typically work with G colour VS1 clarity 1.3mm diamonds unless we match each diamond to your engagement ring stone. This finely crafted design is approximately 2.5mm wide with micro-claw settings and a court shaped profile with side wall. Please allow approximately 4-5 weeks for this design to be crafted to order. Gracefully styled, shaped wedding ring—styled to complement the twist engagement ring design (R1D002) Crafted in a wide choice of precious metals, featuring a subtle contoured shape to allow a perfect fit alongside a twist engagement ring setting. The contoured twist shaped wedding ring takes around 3-4 weeks to create in your chosen precious metal. This elegant ring design benefits from a court shaped comfort fit and subtle curvature to ensure comfort during everyday wear. 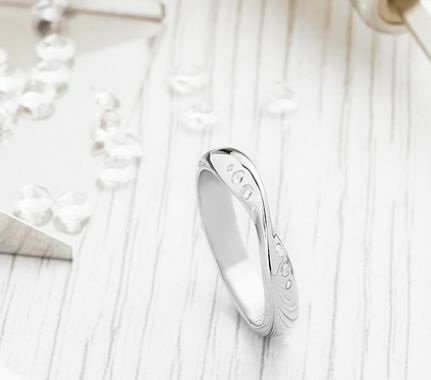 Measuring 2.5mm across, the band matches to the twist engagement ring design and arrives beautifully boxed by secure courier, crafted to order in time for your special day. Whether you are seeking a ready-made shaped design, or need a more intensive personal service, we can certainly help. Our shaped wedding ring service ensures a perfect fit between your engagement ring and wedding ring. From hand carved wax models to cutting-edge CAD design, we conceptualise, design and create some of the world's best shaped wedding bands. Our service is never limited by distance—we can insure your engagement ring on its journey into our care and we have the ability to provide first class jewellery photography of your final commission ahead of final delivery—for your approval. We create most design from shaped, diamond set designs to interlocking bridal ring sets. Talk to us about how we can help. Chat online, message, call or email us with any questions and our team will be delighted to help.